New Left Now: It’s great to talk with you today, John. I came across your Counterpunch article, The Progressive Movement is a PR Front for Rich Democrats recently, and New Left Now is keen to talk to you about it and related fronts. So, if I understand your take on this, the progressive movement is largely ineffectual, and for some fairly obvious reasons. What role does the Congressional Progressive Caucus have to play in the mix here? Why have we not seen more efficacy in what they purport to do or represent? John Stauber: I’m not sure the reasons for the ineffectiveness of the progressive movement are so obvious to people immersed in the Progressive echo-chamber. Individuals who are actively working for economic justice, peace and environmental change as volunteers, who are engaged on these issues in our communities and who see the dire need for real democracy and fundamental political, social and economic change, are often befuddled about our lack of power. Most grassroots progressives haven’t realized that the professional paid staff and paid pundits of the Progressive media, think tanks and the non-profit movement organizations work for corporations. These corporations are completely responsible to their major funders, foundations and any business corporations that fund them. Some like CREDO actually are for-profit business corporations. The Progressive Movement we see, and in whose media and messaging we are immersed, doesn’t exist as an infrastructure to bring about change, it exists as parasitic marketing campaign, directed at those who want real change. It looks like it is a Movement, but it doesn’t function like one. It functions like any corporation. It exists primarily via marketing, PR and fundraising all in the name of public education and mobilization, but funneling all that energy and noise every two years into helping elect Democrats by bashing Republicans and promoting, if with pious and righteous reservations, Democratic candidates. This was the crux of my piece in CounterPunch. Wake up people! If you want change, then organize, create movements and strategies and tactics that serve your interests and goals. These big players — the paid activists at CREDO, Greenpeace, 350.org, MoveOn, the paid pundits at Nation and Mother Jones — they work for corporations who have their own agenda, a business agenda, and are primarily funded by wealthy Democrats and their foundations, or by “socially responsible companies” that these wealthy individuals and foundations invest in. The real agenda of the Big Green groups, the Progressive Media and Progressive Think Tanks, is raising money for themselves. What they do is decided and directed by their small group of decision-makers who are funders or who play to the funders. The professional Progressive Movement I criticize and critique does not ultimately represent or serve any real progressive movement at the grassroots. It markets to them for followers and funding, and every two years votes for Democrats as the lesser of the evils. The Progressive Caucus is made up of politicians who also are accountable to the progressive movement primarily in rhetoric. Ultimately they vote and behave not like some progressive vanguard, but like good Democrats. Some elected politicians at the national level are more liberal than others, and politicians elected out of places like Madison or Berkeley or Manhattan are of course likely to sign up as members of the Progressive Caucus. But our political process is wholly owned by the 1% who fund elections and the two Wall Street political parties. Once a candidate becomes a successful politician, the voters have ever-less control because the moneyed interests become ever more important, and raising money and serving the interests of the party bosses become paramount to continued personal political success. Yes, there are some exceptions to this sort of professional political behavior, but not many. Once a person is elected they can already see their next career move after they are out of office. They too can now punch a ticket to join the ranks of the lobbyists and PR flacks who make the really big money working on K Street or for industry-funded organizations. What hides the reality I’m describing from your readers is wishful thinking on the part of individual progressive activists, who don’t see clearly how corrupt this all is, and how bought and paid for the Progressive Movement and elected politicians are. They are immersed in the Progressive Echo Chamber, where their is plenty of criticism of the Right and the Republicans and the evil corporations, but almost no self-reflection or admission of the lack of a real progressive movement. None of the Progressive Movement professionals dare admit this reality I’m describing. The Progressive Movement corporations excel at marketing, advertising, fund-raising and public relations, they create the delusion of a powerful movement with political clout because it serves their business model and bottom-line. It is easy for politicians to pander to the progressives, because they know there is not a powerful movement that can hold them accountable. Look at the President of the United States, Barack Obama. His rhetoric is often wonderful, and he can tell progressives what he knows they want to hear. But as he himself said in one especially honest moment, he is not doing the work of Martin Luther King, who would oppose him vigorously on issues domestic and foreign. He is not a progressive, and he knows it, but he can play one on TV. He knows that ultimately the Progressive Movement will make sure that the social change vote goes to the Wall Street Democrats, and opposed to the Wall Street Republicans. It’s a wonderful system, the myth and management of American democracy! As one of America’s truly great journalists I.F. Stone said, “all governments are run by liars, nothing they say should be believed.” Governments are run by politicians, and they excel at lying to voters, telling them what they want to hear, and then doing what their real bosses want done. This may be a depressing analysis to ponder for people who desperately want to think that the Progressive Movement is ours and building for change, to hold these politicians accountable – but none of that is true in the real world. But, the first step to freedom and real movement-building and institutional change is knowing these truths, taking off the Blue-tinted glasses. New Left Now: You flesh out some very troubling circumstances. Still, citizens in other eras have faced similar challenges and managed to push an agenda through the anti-social justice blockade. Lincoln and FDR were successful at achieving some significantly progressive legislation, and under the most dire and combative of circumstances. They set in motion, a number of precedents for what others were able to achieve after them, in terms of the social safety net and civil rights. What are we missing today? The appropriate personalities, perhaps? The appropriate backing of those personalities? Do we lack sufficient progressive members in the Congress? What of Alan Grayson? Or Bernie Sanders? We have to start again, somewhere. What lessons can we learn from the progress (or lack thereof) of our most recently elected progressives? John Stauber: I think you put your finger right on the problem, the tendency to look for politicians who will save us! They don’t exist. Lincoln responded to the decades-old movement to abolish slavery, and his hand was largely forced by it. Roosevelt realized that to save American capitalism, he needed to implement reforms; he was driven by the labor and socialist movements responding to the Depression and the brutal excesses of capitalism. Forget about looking for leaders. What we need is a movement that rises from the people and empowers ourselves to reclaim our institutions and create over time the radical changes necessary to bring democracy to our society, our economy, and to re-create industry in light of the ecological wisdom and understanding that has arisen in the past fifty years. It begins with a real movement, which is why it is so important to expose the phony foundation and millionaire funded movements that claim the mantle of social and political change. CREDO, MoveOn, SumofUs, Avaaz, all these “clicktivist” campaigns are not about radical empowering of citizen democracy, nor are they about organizing to make the changes we need. They are marketing organizations that funnel energy back into electing status quo politicians. People need to stop looking up, and start looking around. Remember the old adage, if the people lead, the leaders will follow. New Left Now: What you are saying reminds me of some versions of philosophical anarchy. I don’t suspect that’s really what you are after. Maybe you could explain how such a multitude would function? The variety of Occupy phenomena seems important here in terms of a recent example, too. However, it’s probably not the case that leaders are inconsequential, as I think you suggest. The evidence really does show otherwise. But maybe there’s something more to it. Lincoln reacted, and FDR, yes. But the lesson or point to be made is that someone reacted, who was well placed to do so. Your criticism seems more poignant to me if we think of the functionality and intent of leadership. In other words, many persons who find themselves in roles of leadership, are often not fit to the task, are bereft of ideas, lack a certain strength of will or desire for results, and so on. When masses react en masse…well, the results that come to mind seem riotous and unsustainable in terms of progressive democracy. I think that your point emphasizes the need for individual involvement in the stakes of progressive democracy. I agree, that it’s not enough to simply count on an individual leader, so to speak. Solidarity directed toward progressive legislation will require more than a simple vote or one time donation. Or blindly following the wrong leaders. But without leadership at all – this seems far-fetched, though I am aware that there are certain academic circles wherein such a philosophy is actually held in some esteem. We have to stay focused, however; most truly, the government we are discussing functions on the basis of representative leadership – so leaders, in a very objective sense, are a default proposition. Are you suggesting some other form of governance? Perhaps you can elaborate a bit more on what you envision for progressives, as a way forward, practically speaking? John Stauber: What I am describing is simply Democracy 101. We are so steeped in the cult of celebrities, including political leaders, that we have forgotten how democracy functions. We grew up and live in a society and political system that has become extremely undemocratic. Democracy itself is a foreign concept to us. Of course people need leaders, and people need organizations, and people need to come together to protect our inalienable rights of life, liberty and happiness. The Declaration of Independence and the Bill of Rights are stunning documents written by rather normal people of their day who rose to the occasion and successfully overthrew the most powerful dictatorial monarch of their time. They figured out how to build a nation on radical democratic principles, one that has been passed down to us. Now, like them, we face converging crises that threaten us and our democracy to the core. There is a lot to admire, despite their ugly warts, in America’s founders and the founding principle of democracy. Our basic political problem today is that in the past two hundred years the giant economic corporations that have arisen have seized control of our democracy, our economy and our culture. Corporate wealth rules, and today we have a political system where a tiny 1% pour most of the money into both Parties, and into selecting and marketing politicians, and these politicians serve the interests of themselves, the wealthy and their corporations. The extreme wealth that dominates our economy and political system is destroying democracy, riding rough shod over our rights. At the same time, the industrial revolution that gave rise to it, and the commercialism-uber-alles that it demands to grow, is destroying the Earth’s biosphere and contaminating our air, food and water. Frankly, the fix we are in today makes King George look like a common criminal, not the all powerful God-installed monarch he was assumed to be. Democracy is an ideology with tenets and principles. Concentrated wealth and power destroys democracy, and thus it must be leveled as necessary. That’s the sort of continuing revolution that some of the Founders foresaw because they knew there would also be tendencies toward society becoming controlled by the more and more powerful, who have the resources and the propaganda to eventually dominate. Your question reminds me of Eddie Bernays, one of the most influential political intellectuals of the last century, and the Father of Public Relations who I wrote about in my first book Toxic Sludge Is Good for You. Bernays was a nephew of Freud and a liberal who believed that people were too dumb, banal, easily cowed, and self-interested to be trusted with self-government. Therefore a hidden profession of persuaders, PR experts, media pundits and spindoctors, were necessary to guide the public in the right direction, to get the public to follow the national leaders, so that the status quo prevailed. Bernays helped to build the sort of phony, managed democracy we now endure and people should look at his work to understand our current realities. In a democratic society, institutions and leaders are transparent and accountable to the public. Elected leaders are nothing more than public servants, regular people chosen to serve in office to represent the public interest, not corporate power. In a democracy, when forms of government — and I would include the giant business corporations and banks as forms of government — no longer are servants of the public interest guaranteeing and protecting our sacred rights and liberties, we have an inherent right and duty to overthrow them and institute new institutions based on democratic principles. That’s what the Declaration of Independence states. This new non-violent 21st century revolution I’m describing may never happen. Generations alive today have been mentally enslaved by the sophisticated, hidden propaganda system Eddie Bernays helped pioneer. Most of us alive in the US today were raised on corporate television from birth and starved of reality and truth. The grip of the elite through the media, via the corporations and the corporate-owned political parties is deep and unyielding. But often when times are darkest, this is when a new paradigm born out of courage and necessity and rediscovery of democratic rights arises. As Noam Chomsky points out, here in the United States the brutal and violent oppression that exists in other countries hasn’t generally arrived yet, outside of the most oppressed communities. Americans who see the crisis of democracy have no excuse not to begin the process of coming together at the community level to organize and build the infrastructure and vehicles we need. In fact, this has always been true. For guidance we should not look to politicians. We should look to the powerful grassroots movements of the past, the anti-slavery movement, the peace and labor movements, and the civil rights movement. And we can look at the grassroots environmental movement of the past 50 years, which is still vibrant but completely overshadowed by the big business organizations like Environmental Defense Fund, Natural Resources Defense Council and Greenpeace who have turned it into marketing and PR. Out of the foment of grassroots movement-building should come organizations that serve the goals of the people organizing the movements. Movements must avoid being co-opted by the political parties and by the parasitic non-profit elite — the Progressive Movement I described in my Counterpunch article — that destroys movements. Elections, especially at the local level, can be won by movement candidates, and political changes can eventually be made. But the biggest political challenge we face is that the American system of politics has been stolen from us. Citizens United was just the last nail in the coffin. We need to only support politicians who are willing to bust the Two Party Corporate Monopoly and take down the money-system that runs it. We need many parties, not one big corporate party with two faces, and we need big money’s foot off the throat of our political system. There is no ideology more radical or better than democracy. Democratic rights and principles are what we need to embrace and institute, but we’ve strayed so far from them that most people addicted to politics as usual can’t even imagine democracy. I have zero faith in politicians or those who work in politics, they don’t get it. What faith I have is with people in their everyday lives who in the past have come together to be leaders and create the changes we need. That’s how democracy, and democratic revolutions, work. New Left Now: Many progressives are dissatisfied with the current state of affairs in terms of the lack of policy that materializes in the midst of such seemingly large efforts to produce policy by marquee progressives and the groups that coalesce around them. There is no shortage of emails and advertisements for progressive action. But actual, inclusive and member-collective progressive policy initiatives that are relentless, and that hold the line by growing their influence (which can only be achieved by increasing their numbers), while identifying anti-social justice saboteurs within their ranks, and holding them responsible and accountable for their counterproductive activity (whatever their party affiliation) are lacking. And I think that is where your analysis sheds an enormous amount of light upon a very real darkness within the progressive community, in terms of its exclusion of progressive diversity of thought and political authenticity, in favor of the sort of pseudo-corporate shilling and political profiteering you point out. Any last thoughts in closing? John Stauber: When I started the Center for Media and Democracy in 1993, and began writing PR Watch and my various books, I did so to help us all understand in what sophisticated ways we are manipulated by people and institutions who seek to prevent democracy and social change. Now that I’m retired from CMD I’m trying to especially help activists, organizers and independent thinkers see the ways in which their efforts are co-opted by moneyed interests of the liberal persuasion. Thanks for letting me do that. 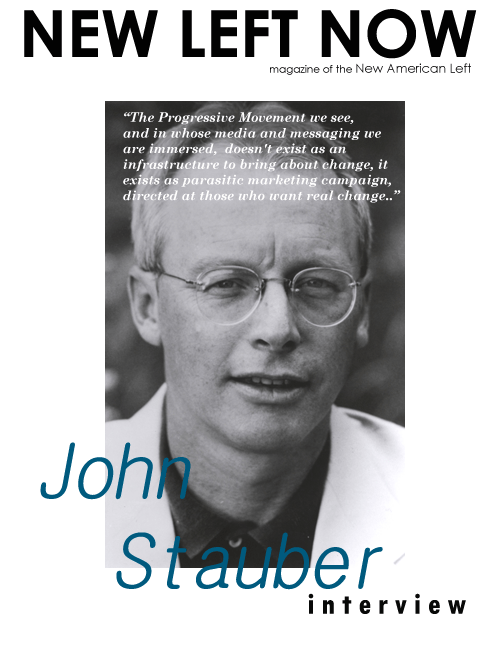 John Stauber is an American writer and political activist who has co-authored five books about propaganda by governments, private interests and the PR industry.